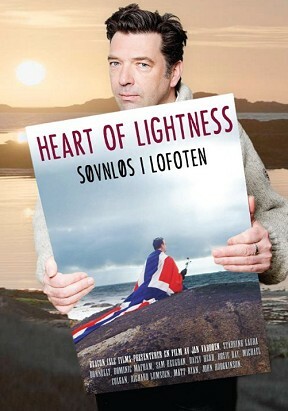 In the new Norwegian movie Heart of Lightness (original title: Søvnløs i Lofoten), Sigmund Groven’s music is featured prominently. It can also be heard in the trailer of the film, which you can see here. In the trailer, you can hear two of Sigmund’s recordings; Kulokk (with Kåre Nordstoga) and Anitra’s dans (with NRK’s orchestra). These two songs are not in the movie itself, as other tracks were chosen for the feature film. Heart of Lightness is the debut movie of famous chef, author and musician Jan Vardøen. It’s a meta comedy with basis in Ibsen, starring among others UK actors Michael Colgan, Laura Donnelly and Sam Heughan. In the film, Jan Vardøen plays a chef called Jan, who has wasted public film funds on booze, but he still has to deliver a movie. He discovers a theatre group performing Ibsen’s The lady from the sea, and asks them to do the play in front of cameras. However, the inexperienced director, a sun that never sets and bad catering takes a toll on everybody. The music was performed by Sigmund Groven as soloist, with Ivar Anton Waagaard, Kåre Nordstoga and The Norwegian Radio Orchestra. These recordings were released by Grappa as Grieg Album in 2007 to coincide with the Grieg centenary that year. Heart of Lightness is screening now in Norwegian cinemas.